This GRAMMY® Award-winning quintet led by gospel music legend Bill Gaither brings tight harmonies to the forefront with this all-new DVD which includes behind-the-scenes interviews with Bill Wes Todd Adam new member Reggie Smith and Gloria Gaither. These Gospel Music Hall of Fame members perform "Chain Breaker " "Hallelujah Band" and more showcasing the iconic musical style and high-energy stage presence that have taken them to venues ranging from The Grand Ole Opry to Carnegie Hall. The Gaither Vocal Band has been making music since the early 80s when four men gathered around a piano before a Bill Gaither Trio concert and began harmonizing on the quartet classic "Your First Day in Heaven." More than a quarter century later the list of men who have comprised the Gaither Vocal Band over the years reads like a "Who's Who" among gospel music's best-loved male voices. 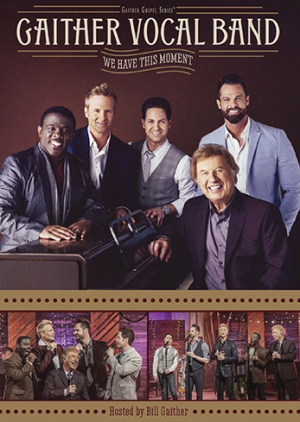 We Have This Moment by Gaither Vocal Band was published by Capitol in June 2018 and is our 3289th best seller. The ISBN for We Have This Moment is 0617884938499. Loved this dvd, some of their best ever music. Got a question? No problem! Just click here to ask us about We Have This Moment.